I’m a big fan of Art Gallery Fabrics. The company taps into some great fabric designers—Maureen Cracknell, Bonnie Christine, and Amy Sinibaldi are a few of my favorites—who create beautiful, modern collections. Plus, the quality of the product can’t be beat. Between the high thread count and super-soft hand, Art Gallery’s fabrics carry a sense of elegance that others don’t. I’ve been meaning to make an AG-only quilt for a while, something that would be a sort of cross-section of the company’s fabric lines. 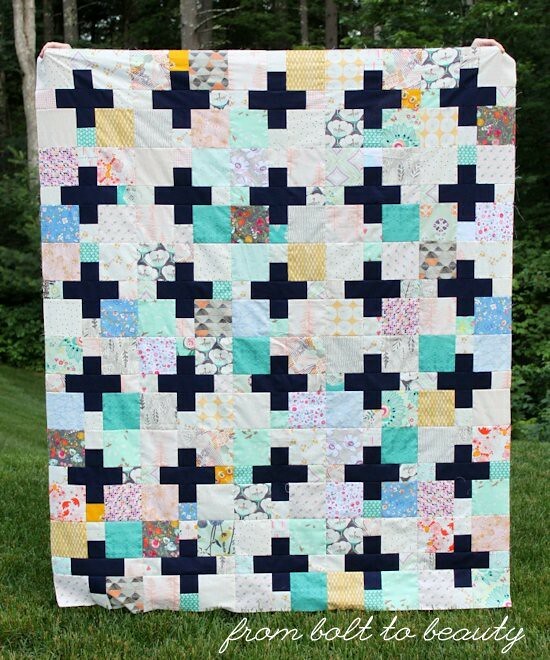 My friend Kim made a plus quilt back in 2015, using some AG charms from a swap I helped organize, and I loved it. Using her project as inspiration Swiping pretty much every aspect of her project, I started with a fabric pull. I had charms from the same swap, some scrappy bits from projects past (like this one and this one), and some yardage that I could play with. Almost all of it went into my quilt top. I’m pretty excited about the results. The quilt includes a lot of disparate fabric lines and colors, but I think it works. What follows is how I approached thinking about the fabric pull and the design. As I culled through the AG fabrics I had on hand—from tiny trimmings in my scrap bin to the large cuts in my stash—I noted the recurring colors. In particular, there were off-greens like teal and mint, mustard, grey, all shades of pink, and blues that bordered on periwinkle. Those colors were my lowest-common denominators, and I used them to judge whether fabrics made it into the quilt. That’s not to say that other colors were avoided; a particular fabric needed to contain some aspect of that palette. And I like to repeat certain fabrics—I’m convinced that simply using some fabrics again and again creates cohesion. That’s where my yardage came into play. 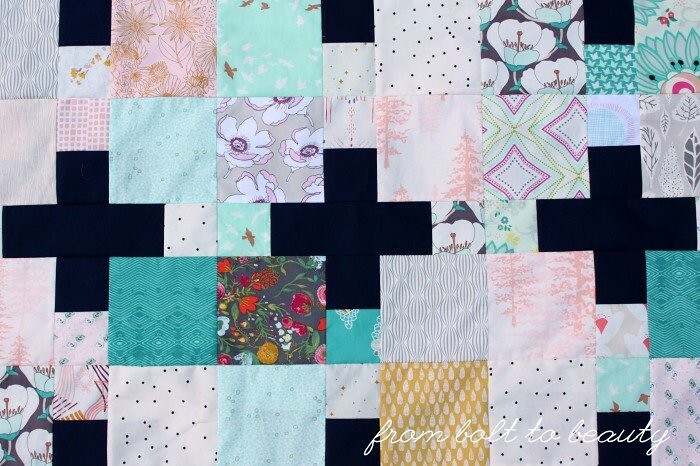 Some fabrics are used for a just a block or two because that’s all I had in my scrap bin. When I had yardage that played into the palette I developed, I used those prints throughout the quilt top. At QuiltCon 2017, in Savannah, I attended Tara Faughnan’s Playing with Solids workshop. This class promised to push us participants out of our color comfort zones. During our three hours together, Tara encouraged us to minimize unnecessary chatter and rely on our own instincts to develop two-color combinations quickly, without overthinking. During this class, she mentioned what she called “bridge colors.” These colors—including hues like mustard, navy, and olive green—are super versatile. Using them can bring harmony to what may otherwise seem like a visual cacophony. (That’s my definition of the concept. I didn’t think to jot down many notes during the class!) Bridge colors are apparent in Tara’s recent finishes (see here), and I’d argue that my use of navy in the AG quilt works as a bridge color, creating cohesion between the main color palette and all the other colors that make an appearance. The concept of bridge colors reminds me of articles I’ve read about—would you believe it?—bridesmaid dresses. I have worn my share of unflattering bridesmaid dresses, but some wedding-planning authorities encourage brides to dress their entourage in a color like navy, plum, or wine. Could those options be considered bridge colors because they work with most hair and skin colors? Why do these bridge colors work in such different contexts? Could it be that they’re not straight-on blue, purple, and red but colors that have a depth and complexity? I’m not sure. It’s interesting, though, and I’ll be more mindful of my use of these colors in future quilts, for sure. 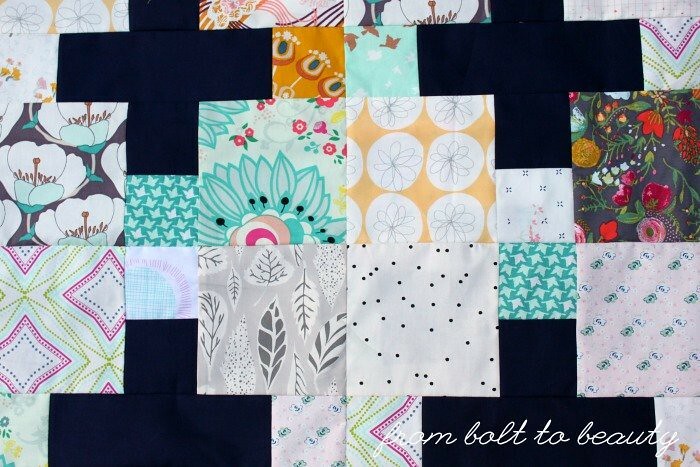 So do you think this quilt top works? Does any of my rationale ring true with you? Do you find yourself approaching projects of your own in a comparable way?